Whenever we think of screen capture the first thing that comes to our mind is PrintScr button and windows paint. But there’s much more to a screen capture than just PrintScreen. What if you need to capture a scrolling window or what if you need to capture just the text portion? For these kinds of captures we need specialized screen capture tool. We can get many such tools if we search the internet but today I will talk about the best of them, Snagit by TechSmith. Many of you must be thinking that why I mentioned Snagit it as the best, for those people I will just say please continue reading you yourselves will find out why it is mentioned the No.1 screen capture tool. Sangit is the most complete and powerful screen capture you would ever come across. Its sheer capacity to capture anything you see on your screen makes it No. 1. Not only can it capture images but it can also capture texts and video clips also. Easy to use and vast number of features makes it more popular. 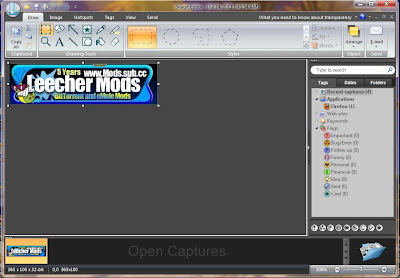 The best thing about Snagit is not only it is a screen capture tool but it is also an image editor. Yes, you heard me right, it does have a separate image editor of its own. So now you can capture and edit on the same tool and don’t have to open 2 or 3 programs for it. The image editor itself is feature rich and thus makes it a perfect combination. 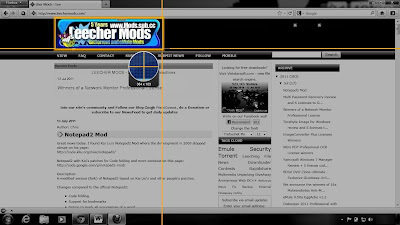 The above screenshot shows the Snagit screen capture tool. It has basically 3 important sections Profiles, Profile settings and Capture button. The profiles section has many predefined profiles for easy capture. Out of all the profiles the All-in-one is the most used. By selecting this profile you can just capture anything. Its inbuilt settings make our job easier. But what if we need to change some settings or create a new profile for our day to day use. Snagit gives us a provision for that also through the profile settings sections. From here we can change various things or create a completely new profile. We can add a new input area, output location and even add effects also. There is also a profile creation wizard with which making profiles are much easier. The third and the most important is the Capture button, clicking which the snagit window minimizes to the taskbar and you can start capturing. The above screenshot shows what happens when we click on the capture button. For the test purpose I tried capturing the logo of our site. As soon as you leave the left click that portion gets captured and the image opens in the image editor. 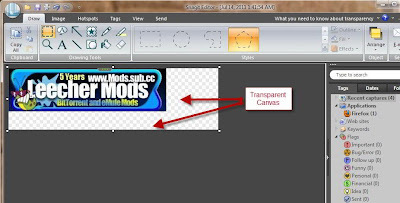 The above screenshot shows the Snagit image editor. The image editor is filled with features to enhance your capture. It has the basic drawing tools and along with it has basic editing tools like crop, resize and rotate. Various effects like grayscale, blur and other color effects are also present. It also has various kinds of stamps and tags. You can even add hotspots, to focus on particular areas, in this editor. After trying out different things I finally able to tear the leechermods logo and here it is. The above screenshot helps you to understand why transparent canvas helps a lot. I hope I was able to successfully guide you through the description and features of Snagit. Though it has much more things inside but this is the basic work flow. It is not possible to completely tell about Snagit in a single article so I would request you all to go through their learning center, where there are loads of article and videos for your guidance. In this article I just gave the basic work flow of Snagit. There are much more powerful things inside this 32 MB tool. Not only it can capture images it can also capture text, video and web pages. It can basically capture anything you can see on your screen. It is very easy to use and with few clicks you can get a professional look for your capture. I started the writing by saying Snagit as no.1 screen capture tool and I will also end by saying Snagit as no.1…………………hope by now you all will agree. We GiveAway 2 Licenses of Snagit for Windows, worth each $49.95. To join the Contest post a comment include a screenshot from our Website and share the Screenshot on Twitter, Facebook, Blog or any other social media site. If you don't have a Twitter, Facebook account you can alternative just upload the screenshot to any image hoster, tag it and post the link in the comment. We draw from all comments 2 winners and send them a license. 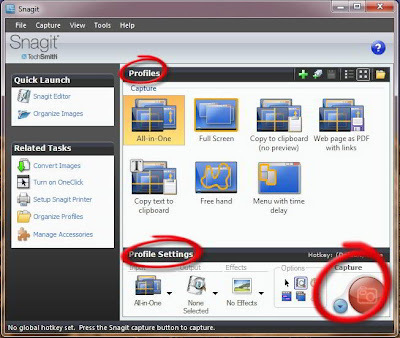 Capturing your desktop is easier now with Snagit. Hi, great giveaway, I used Snagit some time ago - very good software. I agree Chris ( @leecher:twitter ), SnagIt is the most complete and powerful screensaver tool around. I particularly like that it can scroll vertically and horizontally to capture an area that is bigger than the actual screen, which comes in handy when you want to capture a browser window for example. Another one of SnagIt's feature that really impressed me is it's ability to convert a capture into a Flash, webpage, or PDF with working links and other interactive components. The following PNG image is an autoscroll screenshot of this blog page which is over 7 times longer than an average computer screen. I also made a PDF document of this blog page with functioning hyperlinks. Hi. Good program, great giveaway. Thanks. Snagit rocks!!! I'd love to score a license. Thanks for the opportunity! Snipping Tool has nothing on Snagit!! Alpha- thanks for the cool review. Please count me for this Jewel...I agree it's the best out. Pls include me too in this giveaway. This is a very good software. Probably the best screenshot software in the market. Thanks, Chris! Very good software! Very nice giveaway! Thanks for this Giveaway sir. Snagit is the best image capturing and editing tool i have ever used.Please count me in for this Giveaway. Thanks for this contest, i downloaded snagit and installed but during install Avast popuped and asked to do install in Sandboxe, is it a false positive? BEST SCREEN CAPTURE TOOL, TAGGING AND FEATURE OF COMBINE PHOTOS ARE ITS PLUS POINT. ALSO A BROWSER PLUGIN. thank's for this giveaway , pls enter me the draw.